As you evaluate advisory firms that are moving into social business, it is useful to refer to their DNA. Enterprise I.T. firms scale largely by selling products or productized services. Many have “collaboration” solutions, and they tend to approach social business within the context of product strategy. Product vendors are furiously bolting on “social” features to their enterprise software solutions. This characteristic engenders pluses and minuses: they are highly motivated to be relevant in social business because they have a direct line of sight to how it can make them money. On the minus side, they are mostly focused on moving product. Of course, Salesforce is a vendor that is disrupting the whole model (“No Software”). Enterprise I.T. firms have significant promise for addressing the social business adoption life cycle. Like Big Four advisories, they have significant competency in enterprise transformation and process change—and they have the advantage of not being constrained by ties to regulated businesses. Consequently, their cultures are not as conservative. Capgemini is based in Europe while TCS, Infosys, Cognizant and Hitachi hail from Asia. Due to its diversity, this group’s summary will fit for some better than others. Please refer to the Extended Analysis for individual analysis. Enterprise I.T. firms are extremely diverse because their economics work differently. Broadly speaking, Dell, Salesforce, IBM and Hitachi have large hardware and software businesses. Accenture, IBM, Infosys, Capgemini, TCS, Cognizant and BearingPoint have large outsourcing (i.e. recurring revenue) businesses. Significantly, their relationships are usually at more operating levels. As a cohort, they are stronger in implementation and operations than strategy. Interestingly, they are also stronger in the latter part of the Social Business Life Cycle. Feasibility assesses the adoption of social technologies by a client’s stakeholders as well as certain aspects of the client organization, so it emphasizes the market as much as the client’s readiness to implement social business. Although all firms profess to do “strategy,” as a group, market studies and business strategy are not core. Two notable exceptions are IBM and Accenture. No firm showed that they understood the importance of engaging specific stakeholders to increase trust and business, as an actionable goal of social business. Their firm category has a None-Low capability in Feasibility, but note exceptions. Strategy focuses on identifying the optimal social venues in which to engage, determining the client’s highest impact assets and designing pilots to execute the strategy. Firms conduct granular analysis of social venues, stakeholders’ social actions and client assets and business processes. A valuable social business strategy requires strong analytical skills and knowledge of social business practice and an appreciation of trust and relationship. Enterprise I.T. firms do not exhibit high levels of strategy and social analytical expertise, but they show some of the highest levels of social business practice of any firm type. The category has a None-Low capability in Strategy, but there will be important exceptions to the rule. Pilot involves guiding clients’ execution of social business strategy, and Enterprise I.T. firms have a relatively strong demonstrable experience in social business practice. Dell’s forums epitomize open sharing, Salesforce blogs are very strong, IBM has defined thought leadership in social business for years. Accenture has a well balanced mix of Leadership and Practice. As a category, they rank Medium. Scale focuses on forging mature social business programs by expanding Pilot; however, its requirements for expertise are even higher since the effort is more mature and the investment higher. Enterprise I.T. firms are solid in Pilot, as a cohort they have strong operational and business process expertise, but none show they understand the role of trust and relationship in business. On balance, they have a low capability in Scale. Integrate evaluates mature business processes in light of social business and integrates them or replaces the mature process with a social business process. It requires sophisticated knowledge of people and sociality to evaluate legacy processes and fuse them with social business. As a cohort, Enterprise I.T. don’t reflect sophisticated social knowledge, although their relatively strong showing in social business practice indicates that Integrate in within their core competencies. They rank Low for Integrate. Enterprise I.T. firms showed the highest Overall scores of this research survey. They have some of the highest Practice scores, and IBM and Accenture were the strongest in Leadership. These firms walk the walk of social business better than Big Four, Strategy or Marketing/Advertising/PR firms. Analyst firms were slightly lower. Therefore, Enterprise I.T. firms are more credible as social business advisors. In addition, their employee involvement tends to be broadly distributed, which is a strong predictor of the firm’s skills. Enterprise I.T. had the top two Leadership scores; Accenture and IBM have a long commitment to discussing social business as transformation. They have very large thought leadership, marketing and communication programs that address social business in general. IBM especially is widely quoted for its market analysis. Salesforce.com and Dell dominate in Practice, doubling Accenture and IBM. Dell’s use of open blogs and forums is well integrated with its main domain, where prospects can find it. Likewise, Salesforce.com has blogs well integrated with its main domain, effectively extending senior executives’ voices right to the website where prospects can appreciate them. Dell earned the highest overall score of the study—in any firm category. It has been a guiding light in using social media in its business. Remember that Dell had a rough start social media (Jeff Jarvis and the burning laptop); they learned their lesson and have led since then (see my coverage of Manish Mehta’s behind-the-scenes insights). Dell earned an outstanding Practice score; their forums are easy for clients and prospects to find, they are professional and open venues, and they show extensive client and prospect activity. That is the strongest sign of Dell’s success at creating a space in which people want to share problems and solutions. Neither does the company try to sell anything in its forums. Clicking around dell.com, they make known what they are about and how they think they could help you. They also field blogs that are well integrated into dell.com. Their Leadership scores trail the research survey leaders, fellow Enterprise I.T. firms IBM and Accenture. Dell has climbed on the social business transformation bandwagon but recently, where IBM and Accenture have been committed to it longer. Salesforce.com is very active in pushing the “social enterprise” model as a way to challenge traditional I.T. models and vendors. From a structural and cultural perspective, it is a different animal; based in Silicon Valley, it extends its capabilities via partner networks. Salesforce also showed excellent integration of open communication to their main domain. They had the highest quality of executive blogging that was easily accessible. Their site contains considerable information, but it is easy for prospects to navigate. However, their score suffered by the lack of relevant specifics of their social business professional services. They have no defined offerings or services. They also fail to make it clear why they are committed to social business, so it is more difficult for prospects to orient themselves to salesforce.com. It seems implied that prospects need to select a social business partner, but they do not make this clear. Notably, most other Enterprise I.T. and Big Four firms are partners and easily accessible from the salesforce.com navigation bar. Accenture edged out IBM to round out the top three. Their description of social business services is oriented to the Social Business Life Cycle. Moreover, their “Social Media Diagnostic” features a sample diagnostic report that contains some detail but not too much. They write authoritatively about the life cycle and feature specific services relevant to most phases. That said, they missed Practice points on Leader blog and Personability. Their blogs were not relevant to social business, and interactivity was minimal. They project a 20th century firmspeak personality as well. This is a significant, higher order, social business competency they would do well to build. IBM suffered by having too much information and not designing ibm.com for this use case. From personal experience (CSRA is an IBM Business Partner), I know that IBM is an exceptional social business practitioner whose Practice scores would have been much higher if the study design had been different. I know hundreds of IBMers personally and professionally, so I know they have extensive depth and breadth in using social technologies to engage the user in this research survey’s use case. However, ibm.com does not integrate IBM’s blogs and forums, so they are not easily accessible by a prospect. IBM had the highest Leadership score of any firm category because they have pioneered the concept of social business transformation. I was incredulous at the paucity of specificity of their social business transformation services on ibm.com. In this case, they serve as an example of what not to do. In addition, they do lead by having some senior partners blog, but the personability suffers; like Accenture, it feels too much like firmspeak, not engaging like Salesforce and AT Kearney. Infosys and Capgemini do a solid job of integrating blogs into their main domains. Infosys was notable in blogging; they address social business-related issues well and have good interactivity. Capgemini’s Practice score was third in this cohort largely due to its blogging and interactivity, and its integration with their main domain. However, neither firm defines its social business services very well, but their message is clearly transformation. As typical for this firm category, they orient transformation to technology, which shows they have yet to fully discover sociality. The rest of the field exhibited some messaging around social business or social media transformation but did not define their services. TCS, Infosys and Cognizant have comprehensive capabilities, but they are behind the others in defining social business offerings. Enterprise I.T. firms represent one half of this research survey’s Top10. They show that they understand the concept of social business as transformation. As noted above, it is no surprise that, with the exception of Analyst firms, they can most easily monetize social business in the context of their legacy products and services. 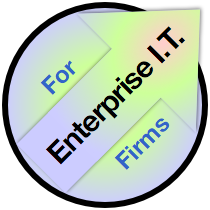 Three Enterprise I.T. firms were Top10 in Practice, which shows that they walk the walk. Analyst and Strategy firms similarly had three of the Practice Top10. However, in Leadership, Enterprise I.T. firms occupy half the Top10. This makes sense; since they have a business rationale and consulting expertise, they have finely honed marketing machines and consultants producing and sharing social business transformation content. I will reemphasize the power of orientation. Enterprise I.T. firms’ strengths can become weakness for companies that want to discover how to use social business to reinvent their relationships with their stakeholders. As a general rule, Enterprise I.T. are here to offer technology solutions, so technology often enters the discussion too early. If you have a trusted relationship with one or more of these firms, you would do well to pursue it; as with all advisory firms, individuals often matter more than firms, so evaluate the team, and validate their competency publicly. Numerous members of the proposed team should be able to share links to open interactions on meaningful topics that are relevant to work you want to do. If not, keep looking. Also look for strong representation on the proposed team of members with Strategy or Big Four consulting experience. Firms’ published Point of view, Practice definition and thought leadership are important signals of firm organizational commitment. Enterprise I.T. firms are stronger than any other firm category here. 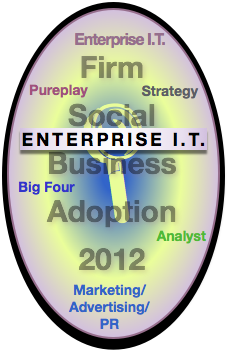 Unlike Strategy or Big Four firms, Enterprise I.T. firms are strongest in Pilot, which emphasizes social business practice. When they field teams with solid strategy consulting experience elsewhere, they can potentially address the entire Social Business Life Cycle. Dell gives us an excellent example of leading with sociality, largely through its forums, which succeed in being customer spaces although Dell employees are well represented. Although social business uses digital tools for social transactions, humanness is the key; the technologies just provide mechanical tools to communicate and share being human. Therefore, sociality is the differentiator. Enterprise I.T. firms do not show that they have an explicit understanding of sociality, although some practice it decently (Dell, Salesforce). There is very little awareness of sociality anywhere, especially in consultancies. Humanness is something people “practice” largely unconsciously, so it represents implicit knowledge and skills. To leverage its power, organizations and individuals must make it explicit to speed their learning process. Early adopters that practice social business and have explicit knowledge of sociality are your best leaders. Look at their blog posts: does a healthy portion deal with humanness, relationships, trust and sociality? Promotion is a small part of being human; don’t be seduced by cleverness. Enterprise I.T. firms do not have conservative cultures that they must transform, as with Strategy, Big Four and, to some extent, Analyst firms. This frees them to adopt more quickly. Do not pick a “type” of advisory firm; look for a balance of leading edge thought leadership and walking the walk. Enterprise I.T. firms show through their people on their main domains that they are comfortable using social technologies for their core business processes. I predict this will continue to grow significantly in the years ahead. Do not allow yourself to be convinced by firm partners that “younger consultants” are facile with social technologies. It is a widespread myth that “anyone under thirty” can “do social media.” Advising companies on using social business to transform their cultures, brand definition and operations requires the ability to interact with social technologies to increase trust and develop relationships. This is beyond individuals’ facility with using the technologies personally. Most important, own your organization’s journey, don’t abdicate to any advisor. Enterprise I.T. firms have broad capability in transformation and operations, so they could be valuable partners if the team were right for your needs. As Score Distribution indicates, think to use Enterprise I.T. firms during some Strategy, but mostly in Pilot and afterwards, where their capabilities resonate strongest with the Social Business Life Cycle. DNA being what it is, if you choose to work with an Enterprise I.T. firm, you must beware their “solutions mindset.” As long as you keep this in mind and correct for it, they are your strongest overall partners. IBM and Accenture have well established Strategy firms within the behemoth consultancies that feature alumni from Strategy and Big Four firms. When evaluating them, use this research survey’s Strategy and Big Four Firm reports. Practice is paramount, and Enterprise I.T. firms show strong. I hypothesize that this is the result of two factors: lack of conservative cultures and a clear path to money, both discussed above. Organizations, in the outdated Industrial Economy view, are impersonal places, and the Knowledge Economy is changing that. All organizations need to go through a period of “humanization.” That means practicing, looking foolish, learning and adjusting in tight cycles. SWOT analysis can be a useful tool to understand advisory and services firm strengths and weaknesses, especially to executives and professionals who have used it, so I have prepared Enterprise I.T. firms’ SWOT analysis in the table. IBM and Accenture have well established and comprehensive strategy practices, which adds to their ability to advise clients across the social business adoption life cycle. Most Enterprise I.T. firms have some strategy capability. Senior executive relationships in many enterprise functions, although often focused in I.T., which is rarely a social business owner. Some market permission for transformation work, especially related to technology. Most have large, process transformation and training practices, methodologies, project management offices, centers of excellence, etc., which can be very valuable in facilitating enterprise transformation. DNA is large-scale projects, which might not jell with social business, which tends to work best in fast-cycle, small teams. Technology product mindsets; most of their revenue comes from large solutions, so social business transformation may play second fiddle. Some firms have a lack of mindshare with CMOs who usually own social business right now; however, as clients realize that “social” means collaboration, it will outgrow the marketing umbrella, so this weakness will diminish over time. Most Enterprise I.T. firms have little CEO mindshare, IBM and Accenture notwithstanding. I.T. represents a significant, growing budget item at most firms; using social business to transform I.T. across entire product and service life cycles would resonate with Enterprise I.T. core competencies. I.T. is maturing fast, which gives Enterprise I.T. firms opportunities and threats; if they use social business to have more spontaneous, continuous relationships with clients, they could innovate faster. Consumerization of I.T. gives firms an opportunity to get closer to end customers (of their clients), and social business could help them capitalize on it; to benefit, Enterprise I.T. firms must reinvent themselves by understanding sociality and humanizing their cultures. To claim their piece of the social business pie, they need to develop core competency in using social technologies as IBM, Dell and Salesforce.com are doing. The Enterprise I.T. value chain is under threat in many areas, which will endanger some of their businesses. For example, Dell has been slow to appreciate tablets’ impact on the P.C. market. Salesforce is a major disruptor in the category (“No Software”). Strengths of Enterprise I.T. firms gravitate toward the middle of the Enterprise Social Business Life Cycle, and many firms have strong strategy teams, too. That said, with the exception of very few individuals, strategy leaders do not show that they understand sociality. No other firm category did better, though. Since Practice is so important, Enterprise I.T. as a category is strongest, especially because Analysts, who easily vie with Enterprise I.T. for top scores, have minimal if any management consulting services. Weaknesses have been well discussed; the “solution mindset” can be “a hammer looking for nails.” This could cause consultants to neglect sociality, the true differentiator. As long as you correct for this and insist on social, not technology, focus, Enterprise I.T. firms can field excellent teams for organizations. Opportunities will accelerate for all firms that understand and tap the power of stakeholders’ sociality. Enterprise I.T. firms have significant market recognition and permission for social business work, but to fully capitalize, they need to reorient away from technology, which is rapidly becoming a utility. Threats loom for Enterprise I.T. firms that hold onto maturing technology too long. As with Analyst firms, they would do well to help clients sunset legacy technology models and solutions. Cloud and virtualization are clearly the direction in general. However, sunk I.T. costs and old fashioned mentalities will prevent clients from adopting quickly, so firms that manage their portfolios can cash cow them for several years as long as they pivot to more social-oriented services. “Web 2.0” suggests that social technologies are a linear progression from “Web” technologies, but that is deceptive. It digitizes sociality, the defining human trait. ?Digital sociality will transform society and business because it changes the economics of relationships, what people do and how they do it. Even more unusual, people are leading the change, not organizations. Generally, disruption increases demand for Enterprise I.T. services. That said, the dynamics that make a difference are changing from mechanical to personal. Less I.T., more “soft” people aspects. Getting your firm’s hands (and arms and shoulders) dirty with being spontaneous and human in transparent environments is vital. Developing explicit competencies in trust building and relationship management at scale will be a huge driver of competitiveness in business. Firms that recognize this and develop competency ahead of the pack will benefit enormously because social technologies are accelerators. You already have armies of developers that are furiously “socializing” your software and solutions, but they likely are treating Web 1.0—Web 2.0 as a linear evolution. It isn’t. You can use consulting to source business scenarios that are grounded in stakeholder reality. It is important that your consulting teams ignore your products so that they can see the changing world in purely stakeholder terms. I.T. is shifting into a more invisible role in business—as electricity did about a century ago in developed economies. You need an explicit effort to reorient your organization away from I.T., and consulting can play a vital role, especially when you untether it from product businesses. It could be useful to think in terms of your own organization’s transformation as a service offering for clients. As detailed in the Social Channel, all organizations will have to undergo profound change to remain relevant in the digital social world. Don’t approach this transformation superficially as some stakeholders will prefer. Most firms are “going through the motions,” and very few partners interact with social technologies. Senior partners have to be involved to make it real. Dell and IBM serve as strong examples of using social for culture change. The more proactive you are, the more choice you will have in how you transform. Laggards will find themselves chasing a market that has accelerated past them and pulling away. Many will go under. A big part of approaching the shift to the Social Channel is approaching it with the right perspective (profound disruption). I believe that firms that adopt first will thrive and others will not survive if they wait too long. The main reason is that social technologies are accelerators—because they enable people to change how they enter and manage relationships and collaboration. The people bit takes most firms much longer than they think. Your existing culture is a major factor of how long transformation will take. Consultants epitomize “knowledge workers,” and social business consultants have individual reputations that may dwarf organizations. You will be better able to engage stars if your firm redefines itself as a platform for individual consultants to develop their careers. Optimize your roles to empower individuals. This requires jettisoning paternalistic attitudes that pervade Strategy firms, agencies and Analyst firms. It is difficult to overstate the profound change that is upon individuals and organizations. Primates are profoundly social; sociality is arguably our defining trait. Making sociality digital will change most human structures, organizations, patterns and habits. To remain relevant, Enterprise I.T. firms need to be in the middle of it—as practitioners. Advisory firms that fail to develop strong social skills will lose relevance because sociality will disrupt clients, so developing social business practices is defensive as well as offensive. Social business capability will enable Enterprise I.T. firms to mitigate the risks in how their existing businesses weather the storm. Clients’ needs will change profoundly, and seeing their evolution from the inside will be a significant advantage. Careful management can maintain existing profit margins for years to come, especially when Enterprise I.T. firms focus on how social business is affecting legacy practices. Treating social business as a linear evolution. No person or organization likes disruption and throwing away things that have been successful in the past. Yet Enterprise I.T. firms will have to throw away many of their products and services over time. If they don’t, the market will do it for them by refusing to pay any more. Failing to appreciate “the human angle.” No one can really understand it until s/he has spent high-value time interacting and building trust online. Very few people understand this, but it is easy to learn once the firm has the appropriate focus. Not starting the firm culture change early enough. The Knowledge Economy is a more personal and public economy, and Enterprise I.T. firms have a significant advantage over Strategy and Big Four firms, which have very conservative cultures that can serve to retard their transition to open, informal entities.. Restricting your firm’s approach to social technologies to product strategy. I can’t say it often enough: products matter less and less. Having sincere interactions and building and managing relationships is where the puck is going. Practicing social media and thinking that is “keeping you current”—as a consulting offering and as a firm. The market overall validates social media because it hasn’t discovered social business yet. Sociality, relating to people, is far more complex and nuanced than promoting things to people. Make sure your firm appreciates the difference. Client expectations are rising quickly. Enterprise I.T. firms that delay adoption too long will never become relevant; this market, because digital interactions move so quickly, develops faster than anything humankind has experienced before. Failing to appreciate that social business is social, which is the engine of everything humans and society do. It will require much more social awareness, which is outside Big Four firms’ traditional competencies. However, neither do Strategy, Big Four or Analyst firms have it. MAP agencies understand people much better than any other firm type, but they are unaccustomed to relating to people. They sell to them. This creates a vacuum in the market.